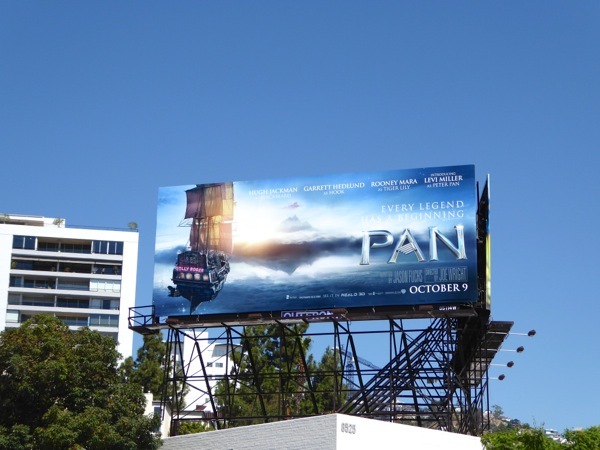 'Every legend has a beginning', and if you think you knew your 'Peter Pan' history, think again, as director Joe Wright explores the origins of J. M. Barrie's infamous boy who never grew up. 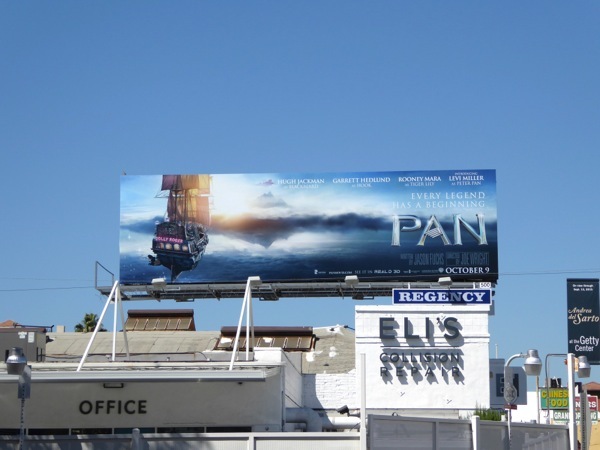 Levi Miller plays the 12-year-old 'Peter' spirited away to the magical Neverland to discover a world of fun, danger and pirates, including Hugh Jackman's 'Blackbeard'. 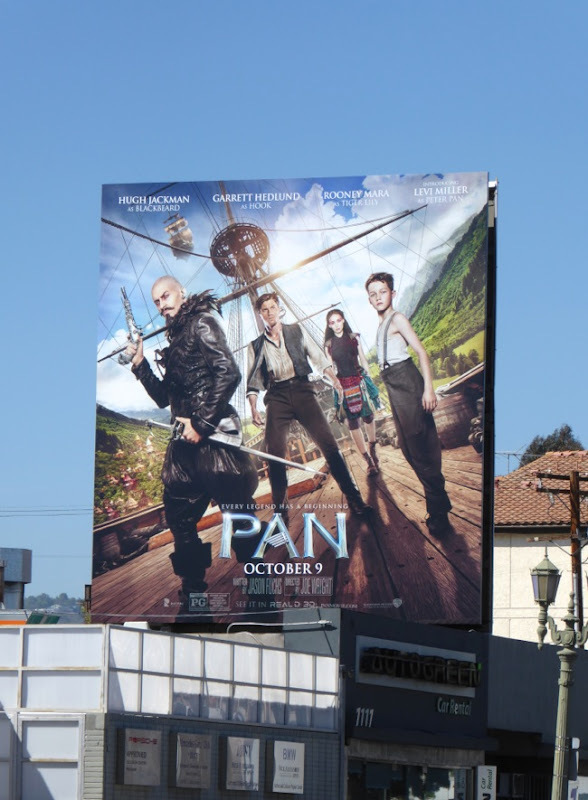 Also part of this cinematic crew is Garrett Headlund as a younger, still two-handed version of Pan's archenemy, 'Captain Hook', and Rooney Mara as the warrior princess, 'Tiger Lily'. 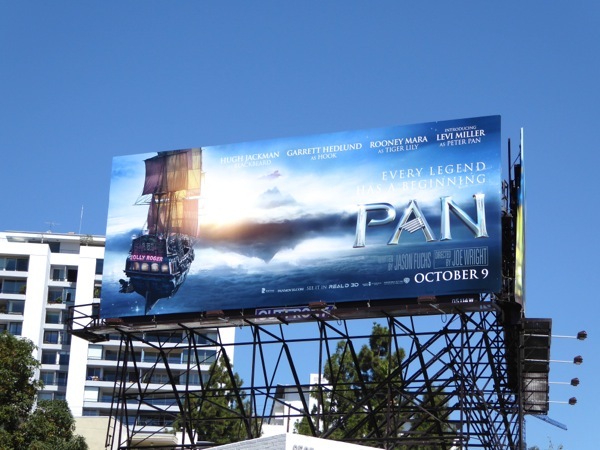 From the looks of these ad creatives for the fantasy adventure, you should expect some swashbuckling, flying pirate ships and maybe a sprinkling or two of pixie dust in this Peter Pan prequel. 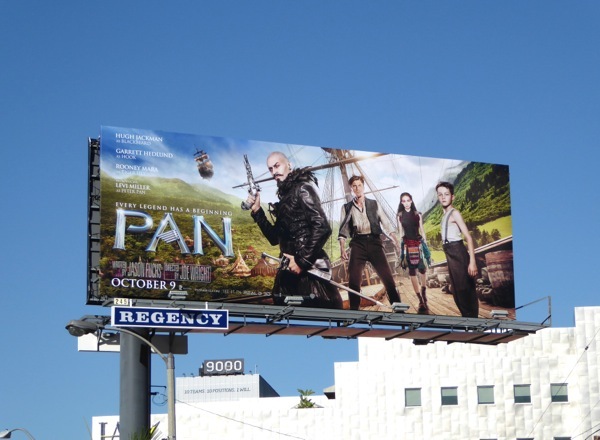 These Pan movie billboards were first spied at The Grove shopping centre on August 22, then around the streets of L.A. including La Cienega Boulevard, Santa Monica Boulevard, 3rd Street and San Vicente Boulevard through October 3, 2015. 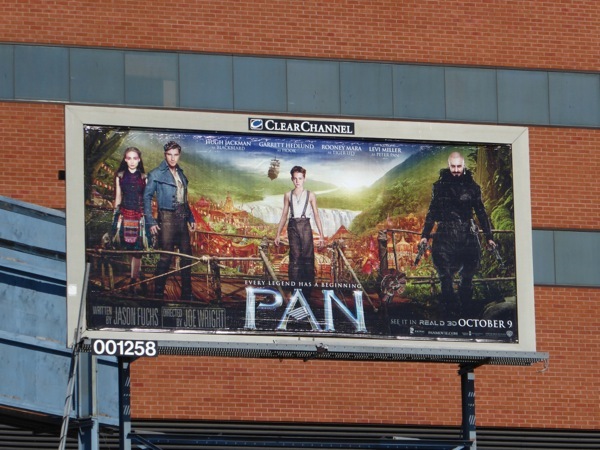 If you're a fan of J. M. Barrie's literary creation, be sure to also check out this Peter Pan Live billboard from last November. 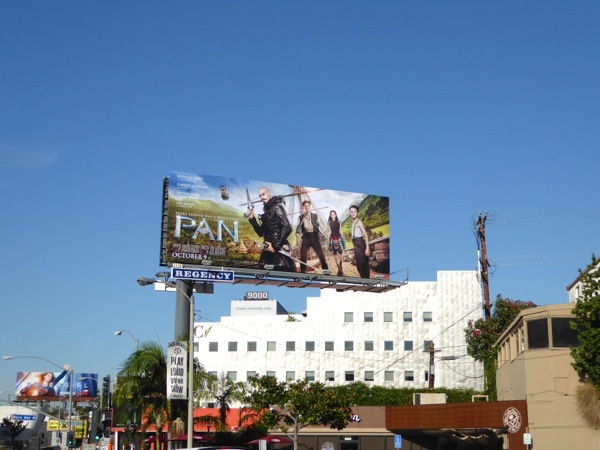 Plus if you're an admirer of Hugh Jackman you can also see him in these Wolverine and X-Men movie billboards and giant Real Steel movie billboard. 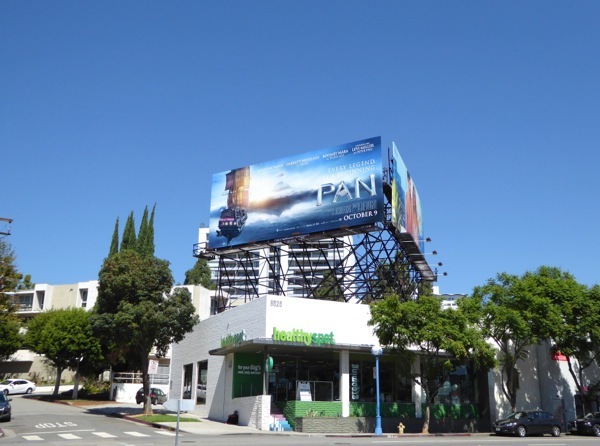 Rooney Mara fans can also enjoy The Girl with the Dragon Tattoo movie billboards and her Calvin Klein fragrance billboard and Garrett Hedlund can be seen in these cool Tron: Legacy movie billboards. 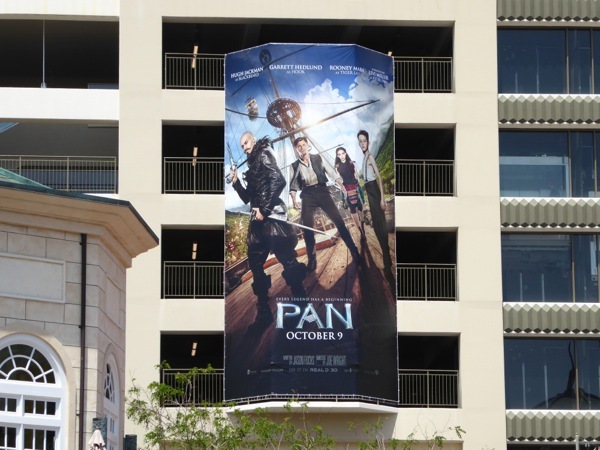 All aboard the Jolly Roger and let's head to the "second star to the right, and straight on till morning" (or to the cinema at least). 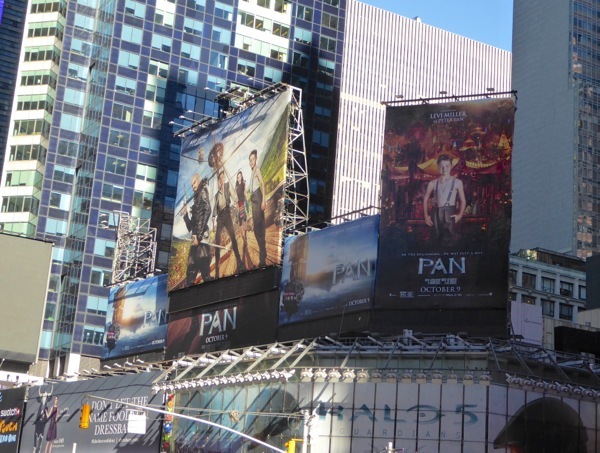 UPDATED: Here's also a collection of billboards for Pan spied above Times Square in New York City on November 3, 2015, although all the advertising support in the world didn't seem to help the fantasy film at the box office.